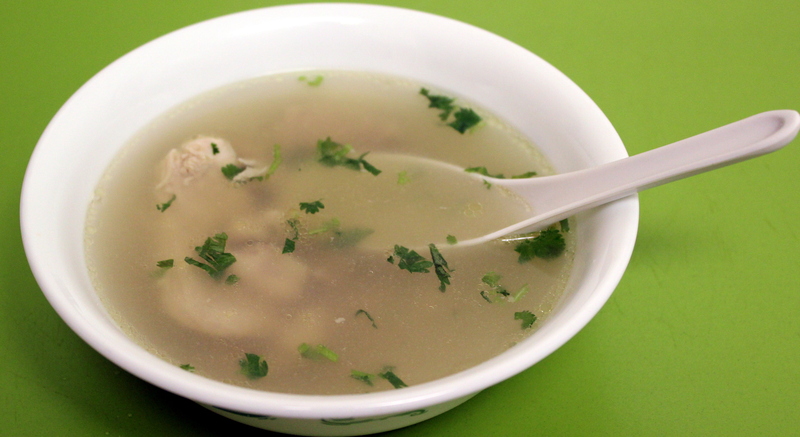 Clear Chicken Soup with Ginger ~ A cleansing chicken soup recipe, with the goodness of ginger, garlic, peppercorns and onions. The flu season is here, and what can be better than a bowl of clear chicken soup with the slow-cooked juices of ginger to help cleanse your system and soothe the sore throat. I had long underestimated the power of this simple yet effective remedy, but gave it a try this weekend to help D fight some virus. Simple, Subtle, Soothing & Satisfying. Add all ingredients from 1 – 9 in a heavy bottomed cooking pot and mix together. Cook on high heat until it comes to a boil and then continue to simmer on medium heat for 1 to 2 hours (though the chicken would be cooked within 30-40 minutes, allowing the soup to simmer for longer helps infuse the flavors into the broth). Take out the chicken pieces, remove any skin and bones. Shred into smaller bite-size pieces or as per preference. Divide the chicken equally into the serving bowls. Strain the soup into the serving bowls. Garnish with some finely chopped coriander leaves and serve. You could opt to not strain the soup and have the onions and other condiments in the soup if you prefer it that way. This soup is typically served up when your stomach cannot tolerate anything acidic or you just need some clear fluids to sooth your throat and body – that is why there are no tomatoes or spicy ingredients in here. But if you are feeling fine and just looking for warm soup then you could definitely add some tomatoes, chilies and other vegetables (carrot, parsnips, etc) as you please!